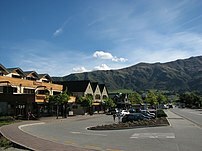 We are a family that come and stay in Wanaka mainly during the school holidays. So we stay for about 3 months a year but we do not live here permanently. We are not tourists and obviously not local. During our time here our friends come and visit and a few people like to know what we get up to. We enjoy skiing, tramping, camping, exploring the neighbouring district, going out for coffee and attending all sorts of local events. We are a family of four. Our children are 5 and 7 so we our activities are often geared around being on holiday with young children.